Menu card for New Years, Moseley's New Haven House, 1908. ..
An 8" x 5" menu card for New Year Dinner on January 1, 1908. Fare includes Oyster Gumbo, Fried Westport Smelts, Mallard Duck and much more. Reverse is blank. Light wear and age toning. . Seth Hamilton Moseley, was the successful hotel manager and owner of one of the finest hotels in New York City. Due to ill health Moseley was forced to retire and travelled through Europe and the United States until 1867, when he moved to New Haven and purchased the New Haven Hotel. The hotel gained a reputation for its exceptional quality and it became the regular host for visitors of Yale, politicians, businessmen and ordinary travelers. An elevator was finally installed in 1887. Martinet Menu Du Jour - Menu Card. Paris. c1880s. ..
A 4 5/8" x 3 1/4" menu card for Martinet, 28 Avenue de L'Opera, Paris. A menu card for Lunch either Prix Fix or ala carte. The front depicts a caricature of a father flying out of his chair when he pulls the champagne cork with frightened children looking on. The reverse is a printed menu format with hand penned fare including prices. Printed by Acker, Paris. c1880s.. Margins appear trimmed. A comprehensive menu featuring 17 categories of fare. The specials are Scallops and Soft Shell Crabs in Season. The most expensive menu item is a Porterhouse for 2 at $3.00. Oysters and Clams were served 14 ways. . Promotes first class service and no dogs allowed. Measures 10 1/2" x 6 1/4". A popular attraction in the 1920s and 30s.. Separated at fold. Age toning. Single-fold menu. Illustrated title wraps. List of mess personnel including the Mess Officer, Sergeant, Steward, Office Sergeant, Kitchen Duty Sergeants, Mess Hall Corporals and Dietitians. Fare included Roast Turkey dinner with all of the fixings. Measures 5 1/2" x 7". .
Single-fold 7” x 4 ½” menu printed on heavy stock. Engraving of a woman on the front, engraved by John A. Lowell, Boston. Fare includes Beef Tongue, Corned Shoulder of Mutton, Boiled Rice, Walnut Catsup, German Plum Pudding and much more. No prices. Cover includes an exterior view of the Sinclair House. . Moderate cover wear. Partial separation on fold; reinforced with archival tape. 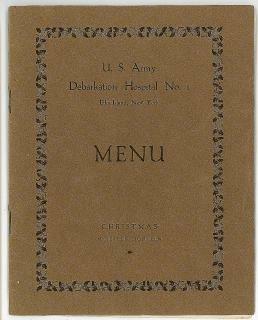 A heavy stock 7 1/4" x 5" menu card with an raised engraving logo at upper left. Title Table d' Hote A comprehensive array of courses with fare such as Boiled Mackinaw Trout, Pate-de foie-gras with jelly, Lettuce and egg and Sommerset pudding. The cost was $1.00 Also promotes the Olympic and Century theatre presentations for the evening. Appears as this menu may have been used at both the Grand Hotel and Planters Hotel. Reverse is blank. Vertical center crease..
Single-fold 6 1/8" x 4 1/4" menu with a color illustrated cover depicting scenes from nature . The front cover promotes Chicago & Grand Trunk Ry, The Great Niagara Falls Air Line Menu "take one as a souvenir" The back depicts an image of Mt Washington Railway. Includes Supper Bill of Fare at 75 cents and Wine List including prices for Champagnes, Claet, Sautern, Ales, Poerts, etc. Penciled additions and strike throughs to fare. .
An 8" x 5" single-fold menu for the Class of '69, held at Delmonico's, Tuesday, June 19, 1866. The menu page and lists of toasts within. Toasts included The Ladies, Fritz and A. O.B, Our Sister Colleges, Our Ponies, Sophroniscus-- a pleasant recreation, etc. The reverse lists the committee. Letter folds and heavy wear..
A 7" x 4 1/2" heavy stock menu card for the Annual Banquet of The Baltimore Cactus Society. The first course includes Ostreum Virginica - Univalvea and Pulque - Extra Dry. Virtually all menu items either include flesh or extract from cactus or a tongue in cheek reference. It concludes with Mescal Button - for those who haven't all their buttons. Reverse is blank..
Tremont House Menu . ..
A 9" x 5 3/4" single-fold menu for the Tremont House, Silas Gurney, Proprietor. An illustration of the exterior of the restuaruantIt is for Saturday, Sept. 18, 1886. Extensive menu with seven courses. Followed by an equally extensive wine list. The back cover is blank. Corner bend front cover. Corner crease..
An 8 1/4" x 6" menu card with a photographic image of a portrait of George Washington on the front, surrounded by a linen frame with a beige satin bow at upper left. Captioned "George Washington". Photo by Pach Bros. NY. The menu on the reverse begins with an embossed logo of The Carolina, Pinehurst. It is for Dinner. Elaborate several course menu including Planed Chesapeake Shad au Beurre, Fresh Lobster a la Newburg, Spanish Souffle Fritters Maraschino and much more. No prices. . The Pach Brothers photography studio is one of the oldest photographic firms in business in New York City, having begun operations in 1867. A single-fold 5 3/4" x 3 1/4" menu with an engraving of a locomotive on the cover. The menu is fro May 6, 1883 and includes eight (8) courses. Pickled Lamb's Tongue and Calf's Head, a la Maitre d'Hotel among the fare. Reverse is blank.. The Riggs House was a prominent hotel in the last half of the 19th century. The building was originally constructed between 1859 and 1860 by famous banker George W. Riggs (1813-1881), with the intention that it be leased out to be operated as a hotel. However, the first tenant turned out to be the federal government, which signed a ten-year lease for the building at a cost of $18,000 annually. Beginning in 1861, it served as the first home of the Internal Revenue Bureau, which then moved into the Treasury Department building some five years later. The Army Quartermaster General's office then occupied the structure for the remainder of the government's lease. The book is made up of mainly two parts. 144 pages. 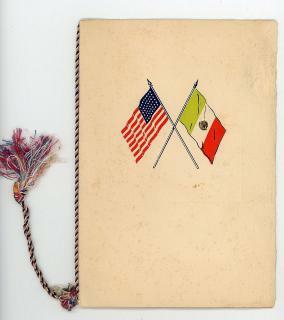 The first are reproduction and images of menus that were exhibited as part of the "Menu Collection" at the Panama-Pacific International Exhibition. The international menu reproductions often represent important or significant meals, usually of political nature, a few others for their lavish nature. There is the menu of the Inaugural Ball Supper of 1901, as well as one from the reopening dinner of the New Palace Hotel. Included on the same page on the images of the menu is a brief caption explaining the occasion and location of the dinner, as well as what was served. The second part is comprised on detailed advice or tips about cooking and dinner planning. There is a section that is dedicated to the appearance and set up of the table as well as how the dinner should be served. The second part also includes some recipes divided by food subject, like soup or eggs and omelets. Each subject has varying number of recipes and depending on the food item some include basic cooking methods or instruction. The first several pages of the fish section is dedicated to explaining the different cooking methods and which kind of fish is best for the method. 10.5" x 7.5" . The author of the book wanted people to use the book in order to feel better able to cook food and to be seen as a resource. Joseph Charles Lehner traveled extensively, he liked to study and observe the food of the area he was in. It was important to him that people actually have some knowledge about the food they consume for a better experience. While the first part of the book is about sharing the extravagant. The second part represents his belief that delicious meals do not have to come with a high expense, there are cheaper options that are not inferior. It is about knowing how best to utilize them that is key. Large format Menu - Chinese Restaurant Union in Jiang Su Province, WWII. ..
A 11 1/2" x 18 1/4" heavy card stock menu printed in English and Chinese. Most likley for an officers club or similar location. Nme the Chinese Restaurant Union, previously name The Orient Restaurant. Fare printed in both English and Chinese. Corrections have been made to the menu by by applying paper and hand penning changes. Reverse is blank. A curious item..
A grouping containing three (3) items including a 4" x 5 3/4" embossed invitation for the Krewe of Athenians Ball, to be held at "The Auditorium". The actual 1 3/4" x 3 1/4" ticket stub for the Midnight Supper-Dance, The Roosevelt Hotel and a single-fold6 1/2" x 4 1/2" menu printed on heavy stock with the embossed emblem of the Krewe of Athenians at the top. The cover reads "Souper Dansant in honor of Her Majesty, The Queen of 1931, Her Maids, The Debutantes, Ex-Courts". The menu within includes Crabmeat Cocktail, turtle soup and much more. Reverse is blank. .
A 9 3/4" x 7" menu printed on heavy card stock for the Triennial Dinner. Illustration depicts a well sated corpulent diner being catered to by tiny minions dancing on mushrooms, diving in champagne and serving up food. Fare includes Blue Point Oysters, Brook Trout, Roast Plover and more. The caption at base reads "I had a dream which was not all a dream" --Byron. Perhaps a reference to the illustration..